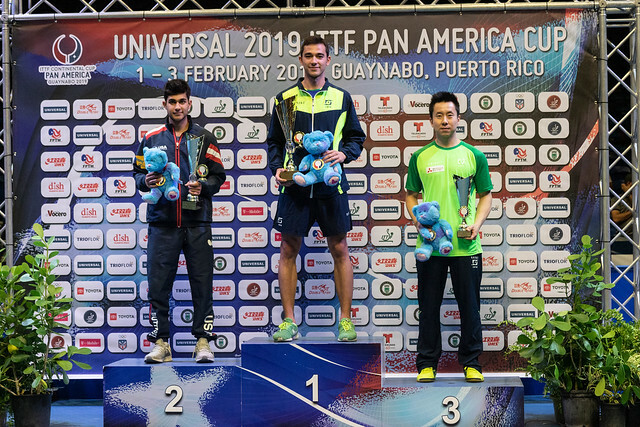 Reigning champions, Brazil's Hugo Calderano and Canada’s Zhang Mo defend their respective men’s and women’s titles at the forthcoming 2019 Pan America Cup to be staged from Friday 1st to Sunday 3rd February. The immediate destination is the Puerto Rican city of Guaynabo; the ultimate journey’s end is the Chinese city of Chendgu, the host later in the year in October for both the Men’s World Cup and Women’s World Cup tournaments. Reach the final and a ticket to Chengdu is booked; in Guaynabo two players will qualify for the Men’s World Cup, two for the Women’s World Cup. Notably, the leading names from last year in Asuncion are all on duty. Gustavo Tsuboi, beaten by colleague Hugo Calderano in the final, appears on the men’s list as does Kanak Jha of the United States. In the Paraguayan capital, he experienced a semi-final defeat at the hands of Gustavo Tsuboi, before overcoming the host nation’s Marcelo Aguirre to gain third place. Now some sixth months later, could there be an exact repeat? In Guaynabo, Marcelo Aguirre is the fourth seed behind Hugo Calderano, Gustavo Tsuboi and Kanak Jha. Meanwhile, in the women’s event, Wu Yue of the United States, beaten by Zhang Mo in last year’s final will be present, as will Brazil’s Bruna Takahashi who finished in third place. After losing to Zhang Mo in the penultimate round, she beat Mexico’s Yadira Silva to secure the bronze medal position. In Guaynabo, Yadira Silva is somewhat down the order, she is the no.12 seed, Zhang Mo is the top seed; Wu Yue and Bruna Takahashi are the respective third and fourth seeds. The host nation’s Adriana Diaz, making her debut in the event, is the no.2 seed. Overall, a total of 16 players in each event, the top four seeds receive a direct entry to the main draw, the remaining 12 players compete in four groups, three players in each group; players finishing in first positions in each group join the top four names in the quarter-finals.